The S&P 500 is up around 8% in 2019, so all the problems of last year are behind us, right? I’ll get back to that question in a minute, but first, let’s talk about the good news. There certainly has been a fair share of positive developments lately. The end of the government shutdown was definitely a positive (although it may not stay open under current circumstances). More importantly, the Fed didn’t raise rates in January and said it will be patient when it comes to future rate hikes. Moreover, the central bank said it would be willing to slow/change the timing of the unwinding of its massive balance sheet as needed. In addition, the January jobs numbers were much better than expected. This suggests the economy is not yet ready to take a dive. A strong economy and low interest rates is a good combo for stock market bulls – at least until inflation shows up (if it does). On the other hand, we’re not yet sure at how long it will be until the trade war with China gets resolved. We’ve seen from company earnings that some companies are getting hit pretty hard as a result. In fact, earnings season has shown mixed results at best. Plus, as I said earlier, the government shutdown could conceivably restart if a budget agreement can’t be found. The government shutdown cost $11 billion last time ($3 billion of it permanent) – so another closure would certainly be seen as a negative. So what does all this mean for market volatility? So far, we’ve seen a substantial drop in volatility as investors haven’t been nearly on edge as they were at the end of 2018. It could be that the market is discounting the potential of a blowup. Or, maybe we’re just unprepared for the next selloff. At least one strategist is betting on the continue softening of volatility through April. 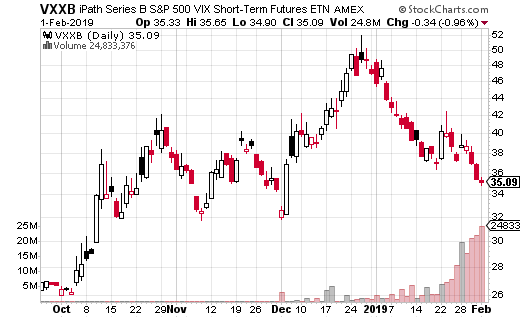 The trader used options on iPath Series B S&P 500 VIX Short-Term Futures ETN (NYSE: VXXB) to make this bet. By the way, VXXB just replaced VXX as the short-term volatility trading instrument. VXX was a 10-year note that expired and has now been taken over by VXXB. Eventually, the B will be dropped and it will become the new VXX. Back to the trade. With VXXB at $35.87, the trader bought the April 34 put and at the same time sold the 30 put for a total price of $1.74. This VXXB put spread was purchased 2,250 which equals $391,500 spent on the trade. The premium paid is also the max loss on the trade. The breakeven point is at the share price of $32.26, if it gets there by April expiration. Max gain is at $30 or below and is equal to $2.26 or $508,500. That’s a 130% gain. So the question becomes, is it a good idea to be short volatility going into April? I’m certainly not convinced our days of high volatility are over. However, if you’re going to short volatility, buying a put spread is the way to do it. Your max risk is limited to what you pay for the premium – you can’t lose any more than that known number. 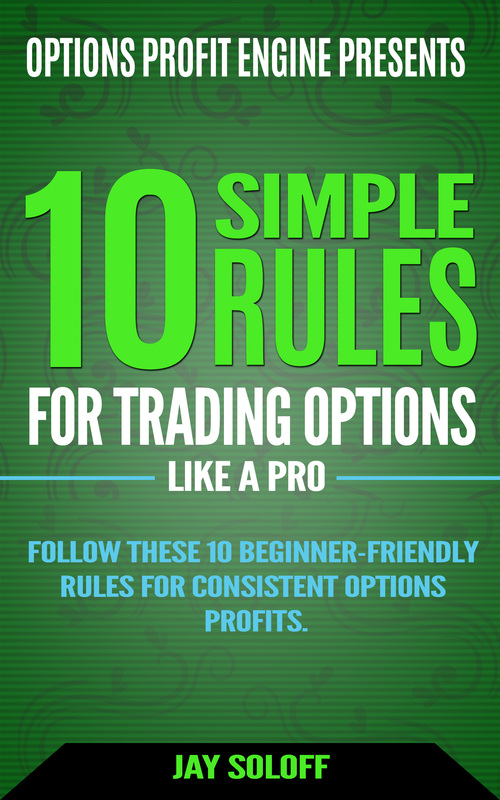 Plus, if you like this trade, you have a chance to make 130% in profit over a scenario that has played out quite often in recent years. Volatility does tend to go down more than up. The only question is will it happen by April expiration.